Sears is apart of the 'Sears Holdings Corporation' which was formed in 2005 when a merger took place between Sears and Kmart. Sears is amongst the most popular retail stores in US and Sears.com attracts millions of visitors every month. 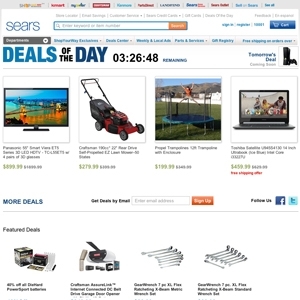 The Sears 'deals of the day' page spotlights multiple highly discounted deals each day and features additional deals that are organized by category. Some of the deals listed on the page are offered by Sears marketplace sellers which is a place that allows merchants to sell their products on the Sears Holdings Corporation family of websites. Sears.com currently ranks #9 amongst sites offering online deals -- Steam ranks #8. In the General Merchandise category, Sears ranks at #6 -- Target ranks #5. Offers deals in a wide range of categories which ship for free. Items from various categories are offered as the Walmart value of the day.